Replace the Seat Arosa windscreen yourself or have it done by a professional? The Seat Arosa is a compact car that scores many points when parking the car. Since this model has been on the market for quite some time, there is a good chance that damage to the car can be found. Do you need a windscreen replacement for your Seat Arosa? Glass damage is high on the list of damage cases on the Arosa, along with a jammed tension roller or a temperature sensor that has been damaged by the unfortunate placement just below the thermostat. Here we will go into the possibilities to replace the windscreen of the Seat Arosa, after first looking at the properties and peculiarities of this model. After all, the possible shortcomings do not make the fun out of the Seat model, which, incidentally, has never been a sales success. Nevertheless, there are still many models to be found in the traffic, as well as from the sister of the Arosa: the Volkswagen Lupo. The Seat Arosa is a very compact car. A lot has been lost to the boot, but when this model came on the market in 1997 as a successor to the Seat Marbella, compact cars were not at all popular. Larger and more spacious cars were fashionable, and the Seat Arosa never made more headlines than today's compact cars. Both the Seat Arosa and Volkswagen's sister have not been a great success. There are still many examples of these cars on the street and many parts are interchangeable, such as the windscreen replacement of the Seat Arosa or the Volkswagen Lupo. These car windows are identical in size. The strength of both types lies mainly in the reliability of the engine block. The Seat Arosa was given a facelift in 1998. In 2000, however, the model was completely renewed. The complete front was modified, the rear lights were changed and the Arosa was given a more aerodynamic construction. The entire interior of the Arosa was also adapted. Few buttons and, above all, a functional layout. There is also a downside to the lack of functionality: there is hardly any storage space in the versions made after 2000. The windscreen of the Seat Arosa was not replaced: it remained the same, just like the wheelbase and dimensions of the car itself. It is remarkable that the sports version of the Seat Arosa 1.4 16V has a theoretical top speed of 188 kilometres per hour (116 mph): in most tests the rev counter counted no less than 4000 revs at a speed of 120 kilometres per hour (74 mph). The diesel versions of the Arosa are clearly the most economical with a consumption of 1:20. The average consumption of the standard version of 1.4 petrol in the new models was around 1:15. When the compact cars did come into fashion, the Arosa and Lupo were still in production. However, they could not win the battle, the competition offered models where the rear seat could be used and there was more luggage space than the limited 130 litres of the Arosa. In addition, competitors such as the Fiat Seicento and the Daihatsu Cuore had more storage space in the front of the car. The Seat Arosa was only succeeded by the Seat Mii in 2012. 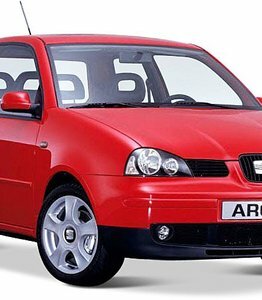 Most people who have glass damage or window problems with a Seat Arosa have problems with the side windows on the front of the car. Problems with the window mechanism are known to the manufacturer: it is possible that your side window suddenly falls 'into the door' because a plastic part breaks into the window mechanism. If you replace the side windows of the Arosa after problems with the window mechanism, replace the window mechanism itself to prevent problems in the future. If you opt for the automotive glass service of our partners, they will immediately look at the problem part. The windscreen replacement of a Seat Arosa is also something that happens annually in many places. Not because there are construction faults or problems with the Arosa here, but because many drivers have to deal with glass damage every year. If you get an asterisk in the windscreen of the Arosa and keep driving, there is a risk that the asterisk will crack further. When the star gets bigger than about 3 centimeters, the car window replacement is necessary. This is an acute task for the cars where the crack is in the driver's view. If you wait to replace your Seat Arosa windscreen, the problems can only get worse. And let us be honest: how much does it cost to replace a car window compared to a fine of hundreds of euros? It is particularly handy to have an extra pair of hands when replacing the windscreen. Especially when removing and installing the windscreen, it is practical to have some help. Of course you can order a new Seat Arosa windscreen directly from us. The car window is interchangeable with that of the Volkswagen Lupo (1998-2005), as well as several other parts. Do you not want to get started yourself because you can't check all the above points, or because you want a guarantee on the assembly of the new windscreen of the Seat Arosa after replacement? Then you can also contact us. Replacing the windscreen of the Seat Arosa can be done directly with one of our certified partners, where high quality work is delivered with guarantees. By using after market automotive glass for the Seat that are exactly the same as the windows of your brand dealer except for the brand logo, the prices are often lower. This is practical when you cannot or do not want to use your car insurance. Whether you're going to do the Seat Arosa windscreen replacement yourself or want to outsource all your work, Autoglas Concurrent is the right place for you!